This is one of those great years when Chanukah comes way before that other holiday. Why is that so great? Because Chanukah isn’t buried behind a bazillion lumens of multi-colored lights, drowned out by non-stop jingly music and pushed off the shelves by 5,000 different kinds of Christmas cards. Now, before you get all uppity and call me a Scroogey Christmas-hating buzzkiller, I’m not saying Christmas is bad; I’m just saying that most years Chanukah is pretty damn hard to find behind all that Christmas hoopla. Let me also say that, having successfully deployed the word “hoopla,” my blogging bucket list is nearly complete. It’s also Thanksgiving weekend in the U.S. Thanksgiving is the day when we celebrate the version of history in which Pilgrims and Native Americans began a wonderful mutually beneficial relationship and had a big feast to commemorate their new status as BFFs. A few hundred years later the Native Americans seem to have lost interest in celebrating it. Weird. We’ve been living in Canada for 7 years now, and up here they celebrate Thanksgiving in October. I’ve asked a few people what it’s about and why it’s in October, but nobody seems to really know. My wife says it’s about the harvest, but as far as I can tell, Canadians got tired of the U.S. getting first billing on all the good holidays. So, yeah, Thanksgiving? Been there; done that, like, a month ago. The U.S. still owns Black Friday, though. That’s the day that all our best values and virtues come together to…um, go somewhere else. But lest you think they’ve gone to Canada, I should point out that roughly 95% of Canadians are in the U.S. right now; they’ve been sleeping in line outside Best Buy since about mid-May. Canadian stores have been trying to do the whole Black Friday thing, too, and it’s really close to being successful. The only things left now are to increase Canada’s population to something a little bigger than California’s, find a way to get everybody the day off work, and maybe have prices that aren’t way higher than those just across the border. I recon they’re on the verge. What does all this have to do with becoming my parents? Beats me; I just wanted to wish you a happy Thanksgivnuka. Actually, I was gonna like this post then leave without commenting just like all those other lurkers up there who liked your post and left. But I scrolled down a little too far and, well… here I am in the comment section. Love your writing. Great post! Happy Thanksgivnuka!!! Well, I don’t know where exactly in Canada you live right now, but you hit the nail right on the head. Here in Buffalo, NY, I stay in my house from 6:00 pm Thanksgiving evening (when Walmart opens), until Monday morning, when I have to go back to work. I understand that the retailers around here need the Canadian dollars (God knows, we in Buffalo don’t have any), but I personally can’t handle the crowds – both Canadian and US. You write with such honesty and wit – I love it! I enjoyed reading this. I am in the UK and didn’t really know much about Thanksgiving until I read a few blog posts like this one. Although there was a fair bit of talk about yesterday being ‘Black Friday’ here in the UK as well, apparently a look of big online retailers on this side of the pond are going to be doing big discounts on Monday for some reason. Well, one has to admit that that “Black Monday” definitely is more sensible sounding than “Black Friday”. You haven’t but feel free to as loudly and frequently as you wish! 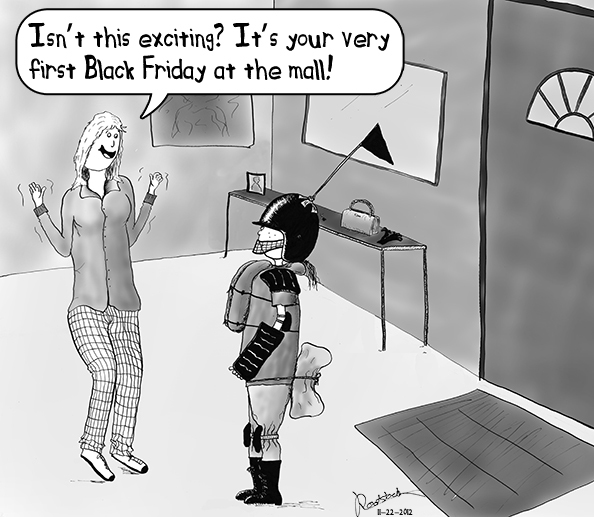 The fact that Black Friday is starting to creep across the border is scaring me! I’m Canadian and I hate crowded and crazy shopping. I would rather pay double! Even the name is depressing… Black Friday. What’s the story behind that? I was on vacation and missed Black Friday. Yet I am still here. This is eerily familiar to how I felt on January 1, 2000. Love that self deprecating Canadian humor. Hi, I stumbled here but ended up reading for last 1 hour. And keep updating the blog…. Sooner or later, we all become our parents. Hope you’ll update your blog more. One of my fondest Jewish meals is the turkey and cranberry. Put it on a bagel with a smear and I am in heaven. Funny blog post. Always love coming here and having a good laugh. Yes its true a lot of holidays are drowned out by a bunch of decorations and its almost as if some holidays’ true meanings are lost. Halloween, a day that everyone dresses up. Thanksgiving, a day that family comes over to eat a big meal. Christmas, throw some lights on the house and get a tree to buy things and put them somewhere. Easter, Easter eggs. Of course, I’m not totally serious, but really a lot of the times I forget what all these holidays are about. This post can be taken in quite a serious manner as to the degradation of holidays and why they’re celebrated, although the main purpose was for it to be funny and somewhat satirical.